Georgie is announced as winner of the 2017 Young Sportsperson of the Year at the Littlehampton Town Sports Awards Ceremony. Amber receives a commendation in the same category! 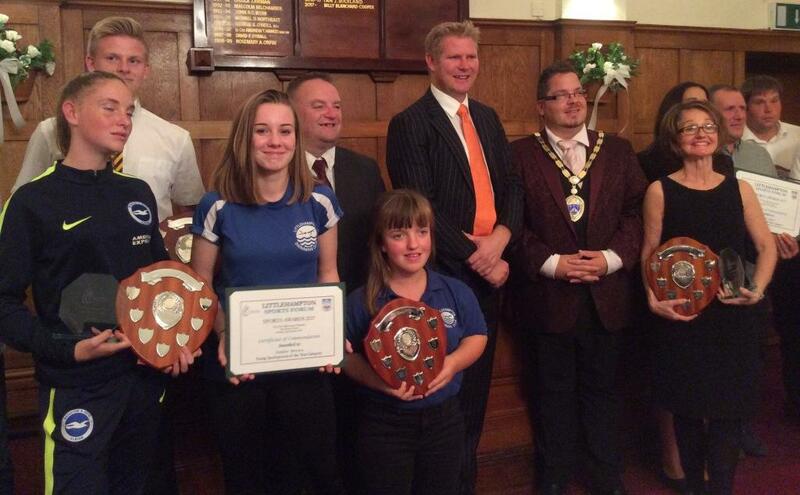 Both girls are presented with their awards by Cricketer Matthew Hoggard MBE. Huge congratulations to both Georgie and Amber on well deserved recognition. Financial Awards for Sporting Excellence were received by Madi Walker, Euan MacLeod, Jessie Brown, Amber Brown, Ella Thornburg and Stephen Redman. 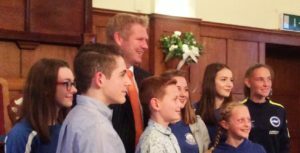 They each received a share of a £2,000 pot the town council award each year to young sportspeople who are at county level & above. They have to apply for the award and must live in the BN17 postcode area. Regular coach reports have to be submitted and the recipients have to show how the money is spent, for example competition entry fees. Next: Next post: Level 1 Assistant Coach Course is a great success!